Annie Fitzsimmons believes that, by choosing a hotel carefully, you can become any person you want - an actor, a writer, a scientist, a CEO, or a fashion designer - even disappear completely if that's what you're searching for. To say she is an avid traveler is an understatement. 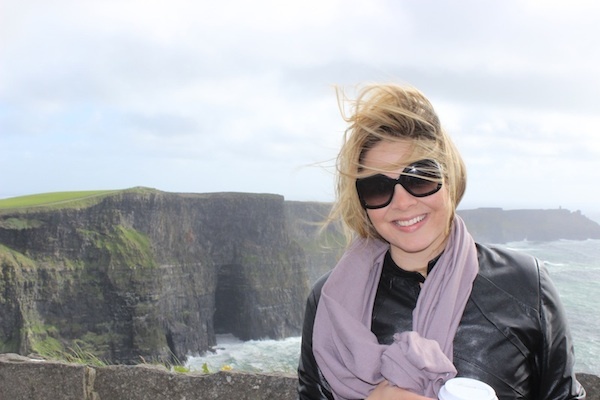 This girl has been to Machu Picchu, the Irish countryside, Jerusalem's holiest sites, and everywhere in between. Even so, Annie manages to always know what's new and great (or old and great!) right here in New York City. I admire Annie for many reasons (which I won't gush about here), but one of the biggest is that she's a trailblazer who built an entire career around doing what she loves. Today, she serves as National Geographic's Urban Insider. Now, she's sharing her expert travel planning tips with all of us! You've been to Peru, Brussels and Dubai, among many other dreamy destinations. How do you decide which destinations to visit and how far in advance do you make travel plans? Many of my travel plans are dictated by work - for example, a cruise line christening in Amsterdam last spring, a conference in Buenos Aires, and a festival in London this summer. On the personal side, I recently rented a house in Ireland with my whole family and I tagged along on my longtime beau's work trip to Israel. As much as the planner in me wishes these trips were reserved months in advance, in reality, they are usually 1 to 2 months out. So what kind of preparation goes into a trip before you hit the road? I am a big believer in preparing before the trip is even planned. If a trip to Tokyo came up for me tomorrow, I'd be 80% ready because I already have so much information saved in documents on my computer and in file cabinets of magazine clippings. It's a continuous game of research for me as I read magazines, blogs, and tweets. The weeks leading up to a trip, I really start culling my information down, finding addresses, and e-mailing friends. And where do you turn for ideas and inspiration when planning a trip? Friends first - real ones and "travel friends" on Twitter and Facebook! I trust people and personalities more than articles where I don't know the author's style of travel. I've also recently started "My Next Trip" and "My Last Trip" boards on Pinterest where I can pin restaurants, museums, shops, and more that I want to visit on my next trip or ones that I found while there. I loved discovering Aspiring Kennedy's blog for London - she's an American now living in London with a voice I absolutely LOVE. It's great finding those reads from people in the know. What kind of preparation goes into a trip when you're actually there? Do you usually stick to the itinerary you've mapped out before hand, or do you go off course ever? I always go off course but ALWAYS have a plan. I'm planning a trip to a fairly large city right now and breaking down all the places I want to see by neighborhood. Then as I'm finding the spots I want to find, I always find unexpected places I love, without fail. Also - if I don't know anyone in a city, I love trying to meet friends of friends while I'm there for coffee or a drink. What kind of apps, gear or other products do you use when planning out your trips? I really love National Geographic's new City Guide apps, and love the beauty of Gwyneth Paltrow's GOOP. The travel site Indagare (fee required) is an amazing resource. OpenTable for restaurant reservations! What are your top 3 pieces of advice for making the most of a destination? Always make restaurant and museum reservations - weeks in advance for big cities like New York, Paris, and London. I have reservations for breakfast, lunch, and dinner every day. This doesn't mean I always keep them. But it's a loose plan that can be altered. By doing museum and event tickets online, you often skip a line and pay less. Scroll message boards and reviews - some of the best places I've found have been from people on review sites saying: "This place is great but this other place is REALLY great." Really search and find personalities you love that live in the destinations, like Aspiring Kennedy (Lauren Bryan Knight) in London, Elizabeth Minchilli in Rome, or Wendy Lyn of The Paris Kitchen. Which destinations have you visited in the past that you're dying to visit again? Always England! I just got back and missed it the second I landed back at home. I want to go to Wales, and the Lake District. I fell in love with Argentina and want to go back to do more of the countryside. I also am desperate to see more of China. Which destinations do you go back to time and again? Home to Arizona (I leave in a couple weeks! ), L.A., San Francisco, Long Island, Hudson Valley, Fairfield, CT, Switzerland and Germany, London. Do you have any expert secrets to sure that you've got the worthwhile stops on your itinerary and not just the touristy spots? I almost never read the big guidebooks. I know there's a lot of great information (and I do love Rick Steves walking tours) but I always find the recommendations to be lacking. Go to the big touristy sites of course, but make an effort to eat and walk in lesser known neighborhoods. Make your own guide book of sorts - curate your wish list every day as you consume media - save tweets from trusted friends or people you admire on their travels, tear out magazine articles and really research the places. I also recommend having a sense of the place's history and current politics before you go - it makes the experience that much richer. Follow Annie's travels around the world on Facebook, Twitter and her blog, Hotel Belle.